East Timor Legal News 13/11/2011 Source: Jornal Independente 14 October 2011 - PM Xanana: Minister Emilia Pires Will Face the Court - Prime Minister Xanana Gusmao has said that the Finance Minister Emilia Pires will have to face the court, to answer suspicions of cases she has involvement in. Although it is not clear what the Minister has done, the Prime Minister Mr Xanana has said that she has already been notified by the court to appear to answer accusations formally made against her. “We have a system in place, we have the courts in place, we have to respect it. I too have to answer to parliament about many other things. If the courts accuse me of something I will have to respond, the government also has to respect the court’s role,” he said. PM Xanana also asked the Anti Corruption Commission to not only look at the US$200,000 state money that was lost but that it also has to be concerned with some investors who ask the state for large funds for projects where much less funds are needed. He gave the example of asking for US$600,000 to construct a road that should only cost US$200,000. Jornal Nacional Diario Friday, 14 October 2011 Corruption, Collusion and Nepotism in the AMP: PM Xanana: “Ministers Will be facing the Courts” - Prime Minister Xanana Gusmao said that Ministers in his AMP government who have been accused of Corruption will have to face the courts, just like the Deputy Prime Minister Jose Luis Guterres’ case who has gone to court, proceedings that are ongoing. In the event Ministers are formally accused by the Judiciary of having been involved in corruption, collusion or nepotism they will be ready to go and answer the charges. “Speaking of corruption, speaking of these things, I am saying, my deputy PM (Jose Luis Guterres) has gone to court, and I mention Minister Arcanjo Leite will be going, my Minister for Justice (Lucia Lobato) will be going, my Minister for Finance (Emilia Pires) will also be going. 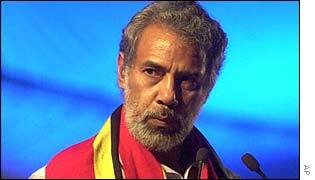 What should they be scared of?” added PM Xanana to journalists in Dare, last Friday 13/10/2011. PM Xanana followed up saying that the government he leads always respects and abides by the principle of separation of powers in this State, but it must follow what the members of his government commit during their governance. “Some people are loud in saying that whoever steals 50 cents, they must be removed, but there must be due process, and if we do not follow due process then we would be acting wrongly,” PM Xanana acknowledged. The head of government also said that he himself is ready to face the court, if one day there is an accusation against him for some wrongdoing. “If one day I am accused of doing something wrong, I ask you all to take me something (food) when you go to visit me in jail, but it must be through due process,” added PM Xanana. However, PM Xanana said that he does not have the power to arrest anyone because of corruption, because other state institutions have the powers to deal with these matters.